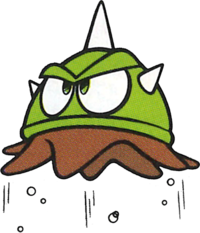 Helmuts are enemies in Wario Land: Super Mario Land 3. They are aquatic creatures that wear spiked helmets. Wario can defeat them by charging into their underside. They share their name with a German forename, while also alluding to the word "helmet". They somewhat resemble Buzzy Beetles because they can hang from the ceilings and cannot be defeated with a jump. ↑ Super Mario Land 3: Wario Land Japanese instruction booklet, page 18. This page was last edited on January 3, 2019, at 21:25.